Talk about knife blade materials with anyone that considers themselves a serious cook and you will quickly hear about their preferences. It generally will come down to a couple of main groups, the “Stainless is King” or “ Carbon or nothing” crowds. There are a very small, and I do mean small few that use ceramic, but for the most part, everyone will fall into one of those two camps. But for our purpose we will be looking deeper at the carbon steels. We will save the Stainless for next time. There are a few things about carbon steel knives that gives them some advantages. But those very things require a little different care. Without going deep into metallurgy, the basic principle is this… carbon steel generally has less than 10% of other alloys added while Stainless has more than 10%. It’s these alloys, such as chromium that makes it stain resistant among other things. There is a hardness difference between the two as well. The carbon steel fans prefer it over stainless for reasons such as edge retention, carbon steel knives will stay sharp longer during use than a stainless blade. And ease of sharpening. Despite normally being harder, most carbon steel blades are easier to sharpen. As with most anything, there are exceptions to this rule. Gesshin hide carbon steel usuba on JKI. When it comes to carbon steel knife blades, there are a few trade offs you get in exchange for the above mentioned bonuses. Such as rust and blade staining. 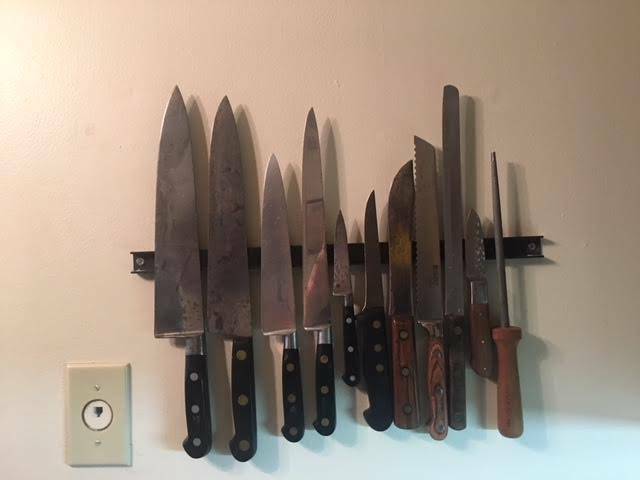 Most users of carbon steel cutlery do not mind the extra steps involved with owning them, they just consider it part of the kitchen prep work or clean up. You can’t just chuck them in a dishwasher. If you did you would open it up to some rusty knives. (It’s a bad idea to run ANY knives through a dishwasher). Caring for a carbon steel blade is simple enough. Hand wash after every use, and dry before putting it away. If it is a knife that is not used every day, I suggest applying a very light coat of mineral oil to it (the food grade/laxative oil) that will protect the blade from rust. I don’t recommend using olive oil, veggie oil etc.. as they can possibly turn rancid or leave a strange taste on your food. Also, be very careful with finger prints. The oils left by fingers on the blade will rust in short order if not wiped off. A simple routine at the end of each meal/day of washing, drying, oiling, wiping down before storing will help maintain them for a lifetime. The patina on the left carbon steel knife is already there. On the right knife no patina is formed yet. You will learn about this one very quickly. Open the box of your brand new shiny chef knife, quickly dice up an onion and watch that blade change colors almost before your eyes. It happens.. and it’s going to happen. Now that you are aware of it, you can make sure it covers the entire blade if you are concerned with how it looks. Depending on what foods you use the knife on it will develop a beautiful patina anywhere from dark grey to blue to almost black. This patina itself will work to help prevent rust from starting on a blade, but don’t depend on it, the protection it provides is very limited. There is a trend with some knife owners to force a patina with the use of vinegar or mustard or some chemical compound. It works, but personally I feel it creates a rough feel to the steel and makes it drag a bit in food. A quick search on the internet will provide you with a handful of methods to force a patina. I want to touch on storage a bit as well. This goes for any knife, not just carbon steel ones. I highly advise against the use of knife drawers. Nothing will dull an edge as fast as jostling around against other knives and metal objects when a drawer is opened and closed. Also, if you are going to use a knife block, make sure the blade is suspended and not resting on wood and take care when inserting the knife that the edge doesn’t rub. Perhaps even place the knives in edge up. Allowing the back of the knife to make the contact.